Thu, Feb 11, 2016, 12:55 pm SL Time, ColomboPage News Desk, Sri Lanka. 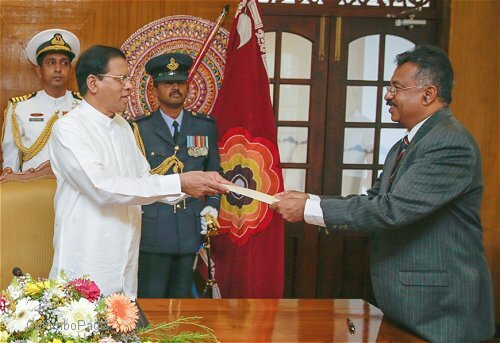 Feb 11, Colombo: Senior Solicitor General President's Counsel Jayantha Jayasuriya took oaths today as the 29th Attorney General of Sri Lanka before President Maithripala Sirisena at the President's Official Residence. The Constitutional Council on Wednesday recommended his name to the post of Attorney General. The Attorney General post was left vacant by the retirement of 28th Attorney General President's Counsel Yuvanjana Wijayatilake with effect from 10th of January 2016. President Sirisena appointed President's Counsel Suhada Gamalath as Acting Attorney General of Sri Lanka with effect from the 11th of January 2016. Secretary to the President, Mr. P B Abeykoon and the members of Mr. Jayasuriya's family were present on this occasion.